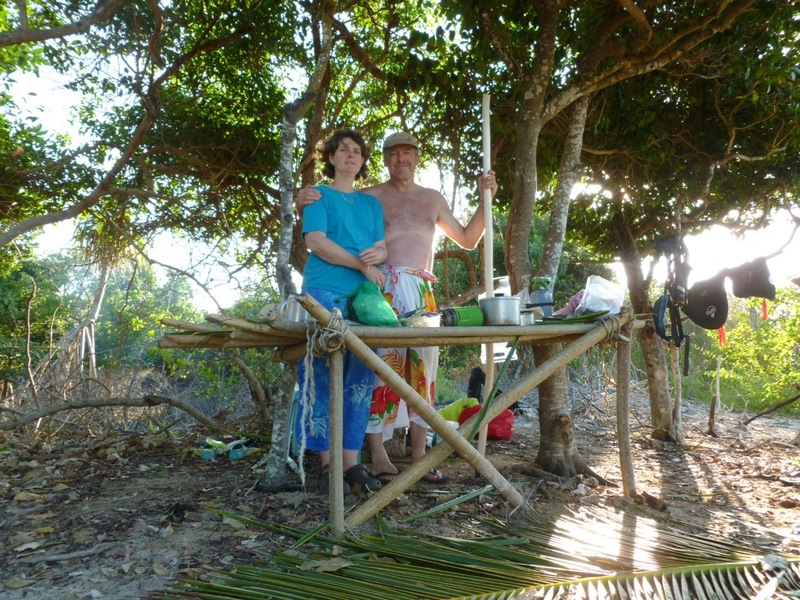 still camped on Uonukuhihifo island and loving the Robinson Crusoe type existence we have. Up early for a beach combing excursion looking for stuff to improve our camp and make life more comfortable. I found some old rope sticking out of the sand and managed to retrieve about 6 meters. 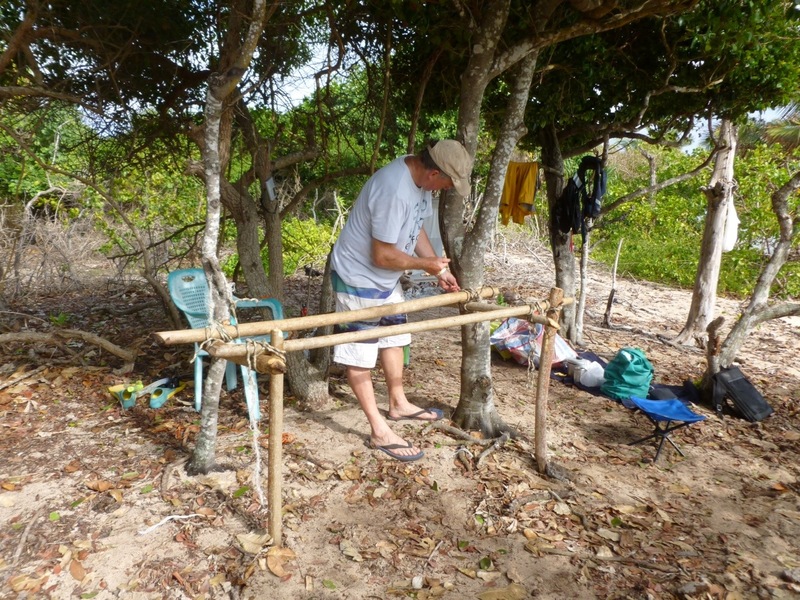 Used the tomahawk to cut some suitable wood with the mission of the morning the construction of a suitable table – enough to get stuff off the sandy ground and make cooking more pleasant. Barb came up with a great idea for a level – a half full plastic bottle ( horizontal ) to get the initial level true between the 2 trees. a luxury indeed – our table cloth is a mens Tongan lava lava – great to be out of the sand at last. 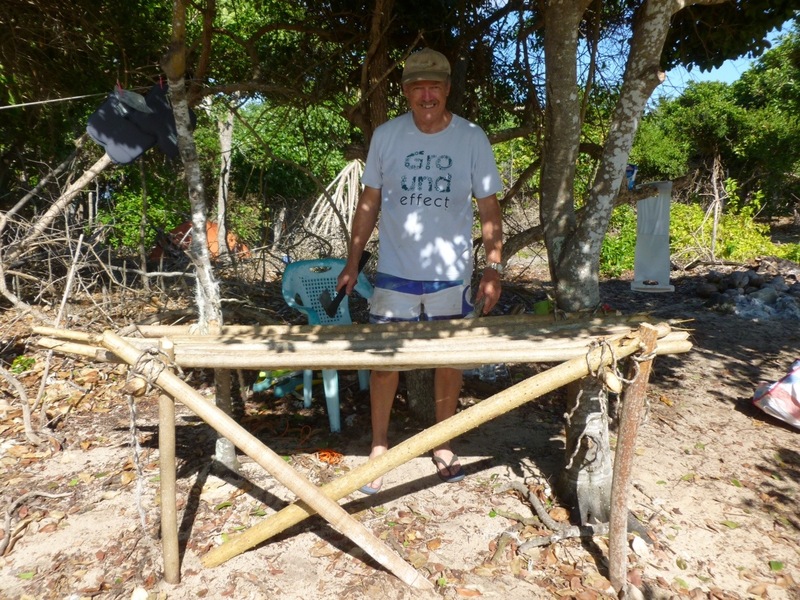 We found a plastic chair with only 3 legs – a carful nick cut into another tree provides the support for the missing leg. There are some short coconut trees here – and the huge green nuts are picked without any hassle. Our only other friend here is a very large sow that looks very pregnant. We have called her ” pig Friday”- she seems to do this round island tour and droops by in the evening to pick up our food scraps. last night we left Friday the uneaten fish , lots of mashed potato and an opened coconut. Friday likes us. we had an unsuccessful fishing excursion but spotted a very large humpback about 300 meters off the starboard bow – quickly retrieved the fishing line as we knew there was no way we could have eaten a humpback of this size in the time available here! We gave chase and saw her huge tail rise and fall a few times but she was clearly on a mission and moving too fast for us.